Sideshift Bow and Stern Thrusters make docking fun. in even the windiest conditions. Simple Docking – Sideshift’s Bow and Stern thrusters make docking your boat as easy as parking your car. No jumping off a moving boat to tie the rope. Stress-free docking! DIY Installation – Detailed installation instructions with step-by-step photos have been successfully followed by thousands of boat owners, just like you. You can save hundreds of dollars or more by installing Sideshift’s Bow and Stern thrusters yourself. You can do it! No holes below the waterline – All mounting holes are above the waterline. 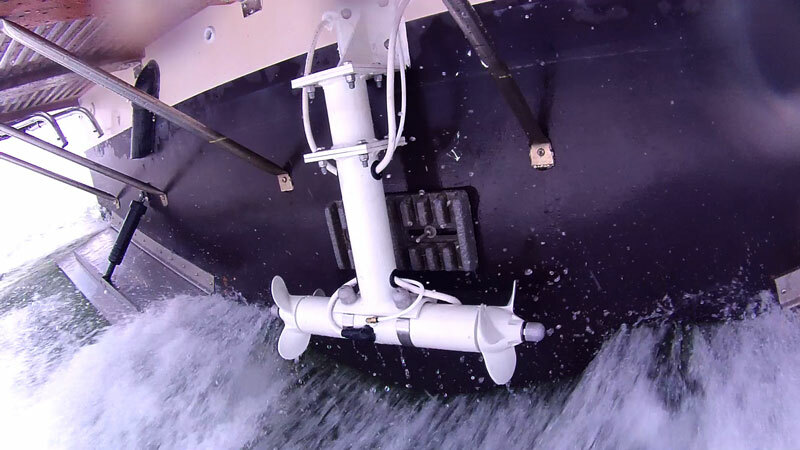 Sideshift’s Bow and Stern thrusters can be installed with the boat in the water! Rugged and Reliable – Sideshift’s Bow and Stern thrusters have been made for over 10 years in North America of high quality aluminum, to demanding Canadian standards. Maneuverability - Sideshift’s Bow and Stern thrusters are mounted as far front and back as possible. This makes the boat very easy to move sideways or turn in a tight spot. Water Cooled & Quiet - Sideshift’s Bow and Stern thruster motors are water cooled while they are operating. The 12V or 24V electric motors are also extremely quiet. Drag-Free – Sideshift’s motors and propellers are located just inches below the water surface. When the boat planes, they rise out of the water and do not create any drag while boating.